The background for this page was made using collaged book pages and paper scraps followed by metallic gold paint applied with a baby wipe. I added a layer of white paint (or was it gesso?) sponged through a stencil to create the triangle patterns, and then rubbed orange Distress ink through a different stencil to create more contrast. 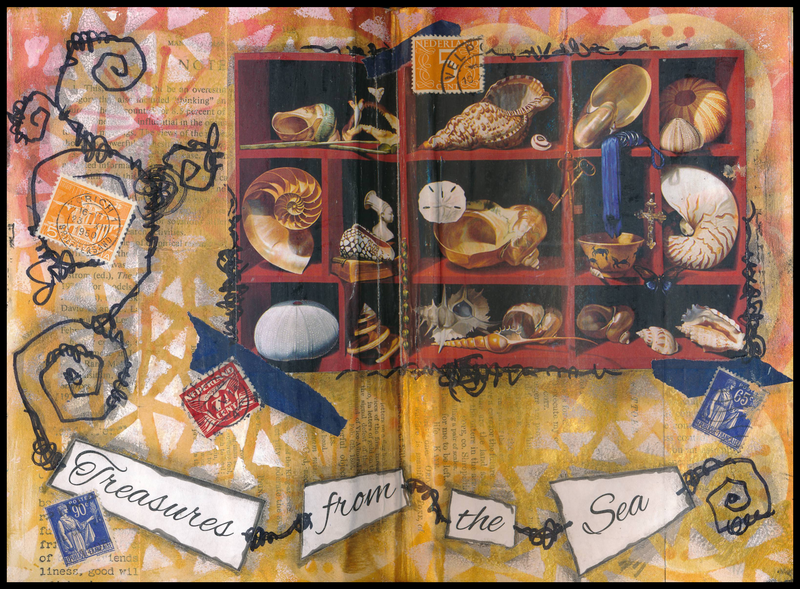 I added the shell image (torn from a magazine), a couple pieces of torn blue washi tape, and real postage stamps. The words were printed on my printer. I tied it all together with scribbles drawn with a black sharpie and smudges made using a black pastel crayon smudged with my finger. I’ve always loved the beach! Click on the image to enlarge it.